Female athletes suffer a higher rate of menstrual problems, muscle and/or skeletal injuries, and poor nutrition intake than non-athletic women. We investigated the link between these problems, known as the female athlete triad (FAT) and the intensity, training amount, and competitive level of college sports in Japanese women. First, we used a classification system that grouped sports by intensity types. Then, we used a Japanese-language questionnaire that 531 athletes and 20 nonathletes responded to. We used ANOVA to find the relationships between intensities, volume, competitive levels, and FAT risk. After analyzing the responses, we found that higher sport intensities caused menstrual problems and poor nutrition intake but higher sports training volume caused more injuries. Competitive level only affected menstrual problems but not as much as intensity. Therefore, we recommend that coaches in high-intensity or high-training volume sports take special care to monitor their athletes for FAT risk. Athletes rely on regular and constant physical training to build and maintain stamina and skill but the training requirements of high-intensity sports put them at a significant risk of microtrauma.1 However, as improvement in athletic performance is highly correlated with training load,2,3 athletes suffering from non-mobility-threatening conditions (eg, menstruation) may feel pressured to continue their high workload, leading to a significant risk of injury in both male and female athletes. We previously reported on mild edema in the calf muscles of female athletes due to ovarian hormone fluctuations that led to reductions in static balance ability and agility.4 Such a connection between training intensity and variation in body condition points to an intimate link between menstrual status and injury risk. Previously, the connection between menstrual dysfunction, musculoskeletal injury, and eating disorders in female athletes has been investigated and reported as the female athlete triad (FAT). FAT is a unique combination of eating disorders, amenorrhea, and osteoporosis in female athletes and results in low energy, functional hypothalamic amenorrhea, and isolated or combined osteoporosis.5 To address this crucial issue, the American College of Sports Medicine first published recommendations for screening, diagnosis, prevention, and treatment of FAT in 1997 (updated in 2007) to reduce health risks, maximize the benefits of exercise, and allow athletes to compete in their best condition.5 In Japan, the FAT problem has only recently been recognized: in 2013, the Japan Institute of Sports Sciences (JISS) initiated programs to study specific FAT-related issues,6 but until recently, these studies have mainly been conducted only in top-level athletes. Conversely, data on collegiate female athletes are lacking, with only few reports on small groups of Japanese students or students in other countries.7–9 There have also been no reports linking FAT to the competitive level of Japanese athletes; higher competitive requirements at the college level (or above) can be reasonably expected to produce more intensive training requirements and exacerbate the effect of injury risk in female athletes affected by hormone fluctuations.10–14 Therefore, the aim of this study was to investigate correlations between the individual risk factors for FAT (amenorrhea, injury, nutrition) and sport intensity in Japanese college athletes. We then extended the parameters to include competitive level under the hypothesis that higher competitive levels will increase menstrual irregularities, increase injury risk, and affect nutrition intake. From April to May 2017, a specific questionnaire developed by our research team was distributed among the collegiate athletes at the University of Tsukuba and the Japan Women’s College of Physical Education. Questionnaires were in the Japanese language (section explanations and answer choices were translated into English for this manuscript). All questionnaires were collected at the same time point and were completely filled in by 551 female collegiate students, including 531 individual athletes, who participated in school-sponsored sports such as basketball, volleyball, track and field, artistic gymnastics, modern dance, swimming, soccer, lacrosse, rescue swimming, cheerleading, sport dance, badminton, fencing, and tennis. A control group consisted of 20 students (2.3%) with no sports activity experience since elementary school. Students were recruited under informed consent during practices and with the permission of coaches and athletic staff. Students were given both oral and written explanations of the study, and written consent was obtained from them. Prior to questionnaire distribution, general instructions were given to each participant. The athletes answered on their menstrual status, recent and past injury history, eating habits and behavior, as well as other demographic information. This study was in accordance with the latest revision of Declaration of Helsinki and was approved by the Ethics Committees of both the University of Tsukuba (approval #28–85) and the Japan Women’s College of Physical Education (approval #2016–23). Menstrual status questions included menarche age, current menstrual status (a: recently had a regular menstrual cycle, b: delayed for ~ month(s), current menstrual cycle (a: the cycle is between 25 and 38 days, b: the cycle is less than 24 days, c: the cycle is more than 39 days, d: the cycle duration is over ±7 days), past menstrual status (a: having a cyclic menstruation from menarche till now, b: experienced a delay of any kind up to 1–2 months ago, c: experienced a delay of any kind more than 3 months ago), experience of taking oral contraception (a: taking it now, b: have an experience in the past though not taking recently, c: never had it). Musculoskeletal injury was defined as an injury (either from direct trauma or overuse) which was the direct result of sports participation and resulted in a training stoppage of more than 3 days. This questionnaire form included details of prior musculoskeletal injuries such as date of the injury occurrence, time lost from practice or competition (days), body part injured, presence/absence of stress fractures, and menstrual status at the time of stress fractures (a: had menses every month, b: had menses with irregular cycle, c: menses delayed more than 3 months). Eating habits and behavior were analyzed as frequency and nutritive choice of meals per day (a: always eat three times per day and well balanced, b: always eat three times per day though not always well balanced, c: usually eat three times per day though not always, d: usually eat less than two times per day), body weight reduction (a: intentional weight loss of more than 5 kg, b: intentional weight loss of 1–4 kg, c: never experienced an intentional weight reduction). Demographic information questions addressed age, height, weight, sport type, training volume (training hours per week), the highest recent or past competitive level (a: national team level, b: national convention level, c: regional convention level, d: subregional convention level), years of experience, and the names of any and all sports experienced in elementary school, junior high school, high school, and college. Sports that were done in gym or physical education classes were excluded as activities prescribed by the nationalized Japanese curriculum served as a common baseline for both the experimental and control groups. To investigate the effect of intensity level to FAT risk, we used the sports type classification by Jere et al15 and divided all athletes into nine groups (Figure 1). Cheerleading, modern dance, and sports dance (which were not included in the Jere classification) have been reported to require higher degrees of flexibility, strength, coordination, and physical fitness levels.16–21 Additionally, rescue swimming (also not included in the Jere classification) is recognized as an official competitive sport that combines such elements as swimming and running, with previous reports showing rescue swimming velocity matching competitive swimmers in the first 50 m of freestyle swimming.22 Therefore, we decided to classify cheerleading, modern dance, and sport dance to Group IIIA (similar to gymnastics) and rescue swimming to group IIC (similar to swimming) (Figure 1). Competitive levels were divided into two groups: “high competing level” to represent national team and national convention level, and “low competing level” which stood for the regional and subregional convention levels. With respect to current menstrual status and cycle regularity, we divided these categories into two groups, including “On Time” (recent menses) or “Delayed” (menstrual delay of 40 or more days) with the additional qualifier of “Regular” (cyclic menstruation every 25–38 days) and “Irregular” (irregular cycle). In cases of amenorrhea, we subdivided the previous menstrual status into two groups: “Yes” (menstrual delay of greater than 3 months) and “No” (menstrual delay of less than 2 months). 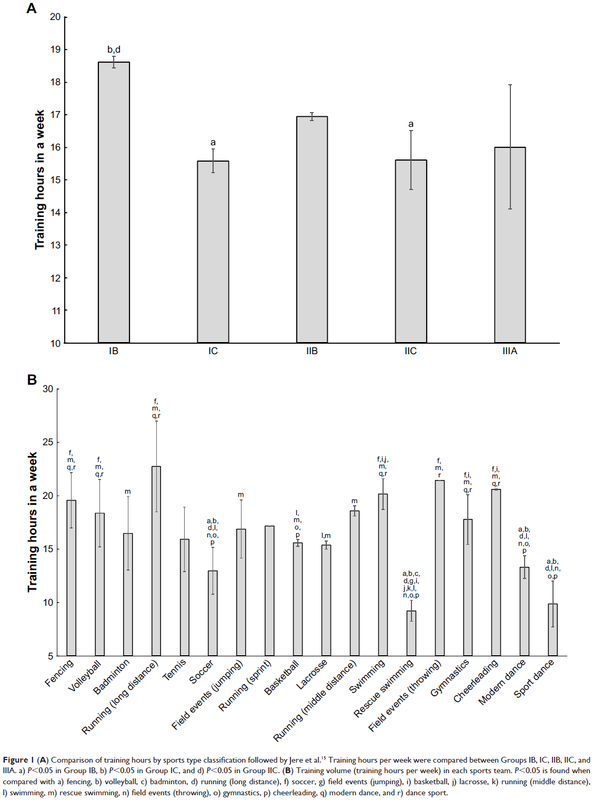 Figure 1 (A) Comparison of training hours by sports type classification followed by Jere et al.15 Training hours per week were compared between Groups IB, IC, IIB, IIC, and IIIA. a) P<0.05 in Group IB, b) P<0.05 in Group IC, and d) P<0.05 in Group IIC. (B) Training volume (training hours per week) in each sports team. P<0.05 is found when compared with a) fencing, b) volleyball, c) badminton, d) running (long distance), f) soccer, g) field events (jumping), i) basketball, j) lacrosse, k) running (middle distance), l) swimming, m) rescue swimming, n) field events (throwing), o) gymnastics, p) cheerleading, q) modern dance, and r) dance sport. SPSS version 24.0 (IBM Corporation, Armonk, NY, USA) and the one-way ANOVA with Bonferroni post hoc test were used to evaluate differences between each of the quantitative indexes in classification groups, current menstrual cycle, mealtimes, and weight reduction. Pearson’s correlation coefficient was used to investigate the relationship in the quantitative index in each classification group. Non-paired t-testing was done to evaluate the differences between the quantitative index and competitive levels, current menstrual statuses, histories of amenorrhea, histories of musculoskeletal injury, and histories of bone stress fractures in each sports type. One-way ANOVA with Bonferroni post hoc test was performed to evaluate the differences between the quantitative index and mealtimes and weight reduction in each sports team. Chi-squared testing was done to determine the relationship between nominal variables in all athletes, groups, and each sports type. Relationships between competitive levels, current menstrual statuses, histories of amenorrhea, mealtimes, weight reduction, histories of injuries, and histories of bone stress fractures were all compared, and Fisher’s exact test was also performed in a small sample size. 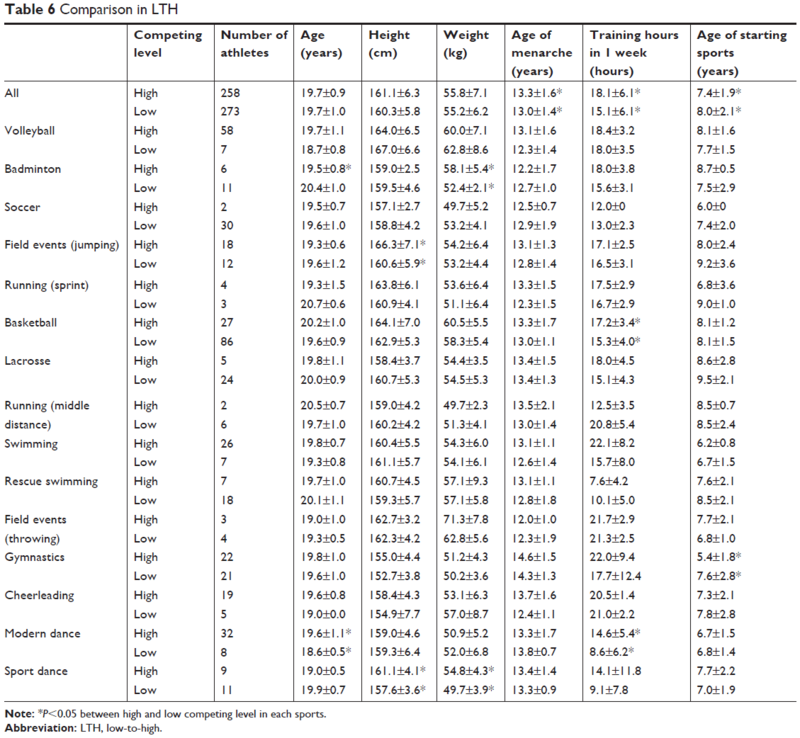 Mean values of age, height, weight, menarche age, training hours per week, and starting age are shown as ±SD and alpha values of less than 0.05 were considered significant. Within each sport, comparisons were made between low and high competition status while additional analyses (with respect to competitive level) looked at comparisons of each sport type to its group as well as between each of the groups. For low-to-high (LTH) competitive comparisons within each sport type, no normalization was done. However, for sport-to-group (STG) comparisons, the specific sport’s results (average LTH values) were normalized to the average LTH scores of that entire group. For group-to-group (GTG) comparisons, average LTH values were used. All values reported were mean±SD and alpha values of less than 0.05 were considered significant. 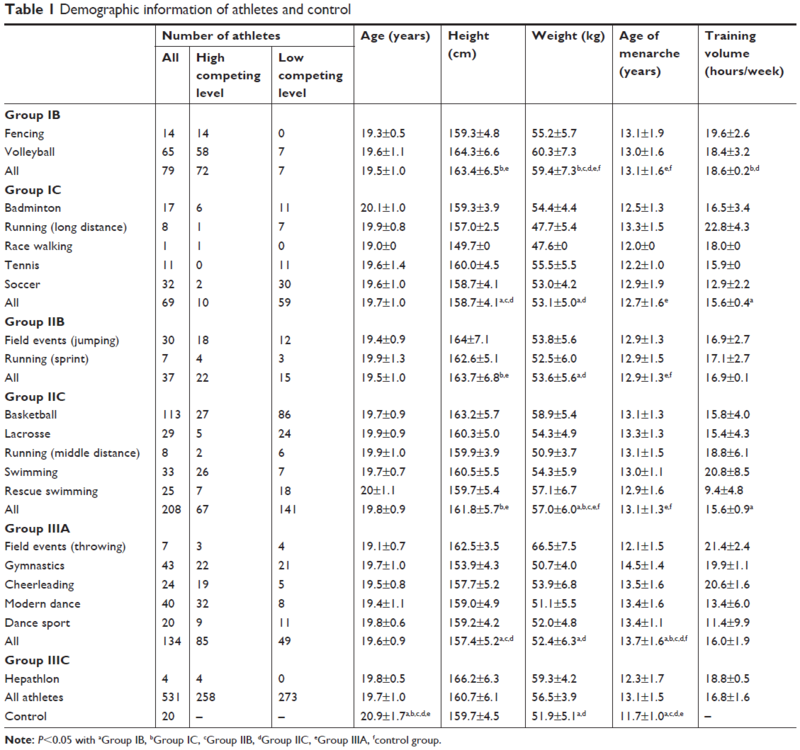 The results of the classification and demographics of athletes who returned our questionnaire are shown in Tables 1–3. Group IIC had the highest intensity within all sports and Group IIIA had the highest training volume. As for FAT criteria, 270 (49%) athletes had menstrual dysfunction, 15 (2.7%) had low energy availability, and 108 (20%) had low bone density. These athletes therefore met only one of the three criteria. As for two of the three criteria, 58 (11%) athletes had both menstrual dysfunction and low bone density, 3 (<1%) had both menstrual dysfunction and low energy availability, and 1 (<1%) had both low energy availability and low bone density. There were only 4 (<1%) athletes who met all three criteria. Note: P<0.05 with aGroup IB, bGroup IC, cGroup IIB, dGroup IIC, eGroup IIIA, fcontrol group. Notes: Athletes who have met at least one of the following were defined as MD: 1) Athletes who have answered their current menstrual status as b: delayed for ~ month(s). 2) Athletes who have answered their current menstrual cycle as b: the cycle is less than 24 days, c: the cycle is more than 39 days, or d: the cycle duration is over ~ ±7 days). 3) Athletes who have answered their past menstrual status as b: experienced a delay of any kind up to 1–2 months ago, c: experienced a delay of any kind more than 3 months ago). Athletes who have answered to have their meal usually less than two times per day and frequently lose their weight intentionally were defined to have a risk of LE availability. LBD was defined as athletes who have answered to have an experience of bone stress fracture. Abbreviations: FAT, female athlete triad; MD, menstrual dysfunction; LE, low energy; LBD, low bone density. 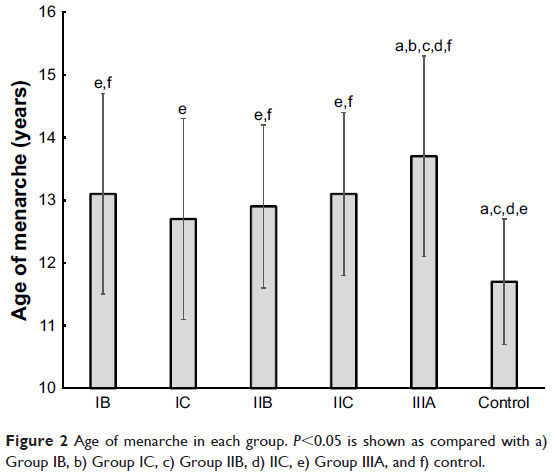 Age of menarche was significantly lower in the control group compared with Groups IB, IIB, IIC, and IIIA, while Group IIIA was significantly higher than Groups IB, IC, IIB, IIC, and control group (Table 1; Figure 2). There was a significant negative correlation between the age of menarche and the age of starting sports as well as weight among all athletes (rs=−0.099 and −0.114, respectively; Table 2), which was also seen only in Group IIIA (rs=−0.230 and −0.181, respectively; Table 4). Figure 2 Age of menarche in each group. P<0.05 is shown as compared with a) Group IB, b) Group IC, c) Group IIB, d) IIC, e) Group IIIA, and f) control. Intensity number did not affect the number of athletes who experienced musculoskeletal injury severe enough to require rest for more than 3 days. Group IIB showed significantly higher numbers of athletes who had experienced stress fractures while Group IIC showed significantly lower athlete numbers with regard to stress fractures (P=0.038; Table 5). Group IIIA reported a significantly lower number of athletes who usually have well-balanced meals three times per day, while Group IIB and IIC reported significantly higher numbers. Furthermore, in weight reduction, Group IIIA reported a significantly higher number of athletes who frequently reduce their weight over 5 kg or around 1–2 kg for improvement of sports performance (Table 5). The results of LTH (Table 6), STG (Tables 7–9), and GTG (Table 11) comparisons contained differences. In LTH (low competitive level vs high competitive level) classifications within each sport, basketball and modern dance showed significantly higher training volumes in high competitive level than in low, a trend reflected in all athletes. According to the classification of intensity level/training volumes in STG comparisons (comparisons of individual sports to the others within their respective groups), there was no significant difference in competing level and sports type in Groups IB and IIB (Table 7). However, within the groups, there were differences in athlete numbers with respect to competitive levels. In Group IC, badminton had a significantly higher number of athletes at the high competing levels. In Group IIC, swimming had a significantly higher number of athletes in a high competing level while basketball had a significantly higher number of athletes at a low competing level. In Group IIIA, modern dance had a significantly higher number of athletes in a high competing level while gymnastics had a significantly higher number of athletes in low competing levels. Through variable indexes, there was no significant difference seen within Group IB (Table 7). Groups IC, IIC, and IIIA showed significant higher training volumes at the high competing level than in low. With regard to nominal indexes, no significant relationship between competitive level and other nominal indexes was seen in Groups IB, IIC, and IIIA (Tables 8 and 9). Within GTG comparisons (comparisons between each of the groups), a significantly higher number of athletes were in the high competitive level in Groups IB and IIIA while Groups IC and IIC were significantly lower (Table 10). Note: *P<0.05 between high and low competing level in each sports. Note: *P<0.05 between high and low competing levels in each group. With respect to age of menarche, there was a general increase as competitive level increased which was seen only in overall comparisons but not in our intensity-classified groups. Within each sport, there was no significant relationship seen between current menstrual status and competitive level. 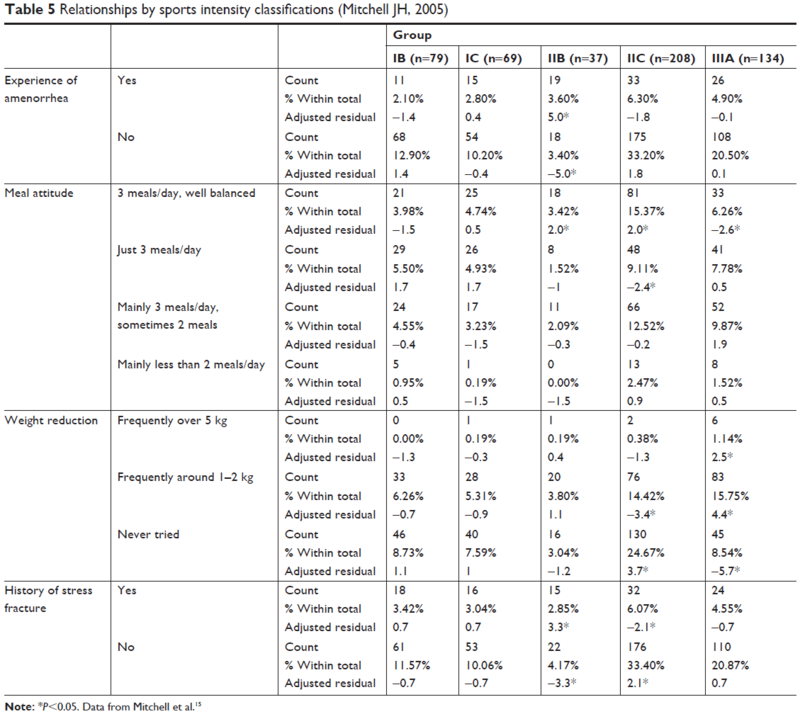 However, in comparisons through classification of intensity level groups, Groups IC and IIC showed a significant relationship between menstrual status and the competitive level (Table 11). The number of athletes in all groups but IIC who currently had a regular menstrual cycle was significantly higher at high competing levels while the number of low competing level athletes was significantly higher in menstrual irregularities (including oligomenorrhea, amenorrhea, and polymenorrhea). Additionally, the number of athletes with past experience of amenorrhea was significantly higher in lower competing levels while the number of athletes in high competing levels was significantly lower in all athletes (Fisher’s exact test, P<0.001; Table 12). A notable exception to this finding exists: Athletes in the high competing level of Group IC had significantly higher numbers of athletes who experience amenorrhea (Fisher’s exact test, P=0.026), which was completely opposite to the result seen in all athletes. Generally, the effect of competitive level on musculoskeletal injuries, especially stress fractures, was not significant in all athletes. However, in Group IIC (Table 9), lower competitive levels had higher numbers of athletes with injuries, but not stress fractures, and in Group IIB (Table 8), athletes who did have injuries were more likely to have stress fractures. This counterintuitive relationship between low and high competitive level was seen only in Group IIC sports. 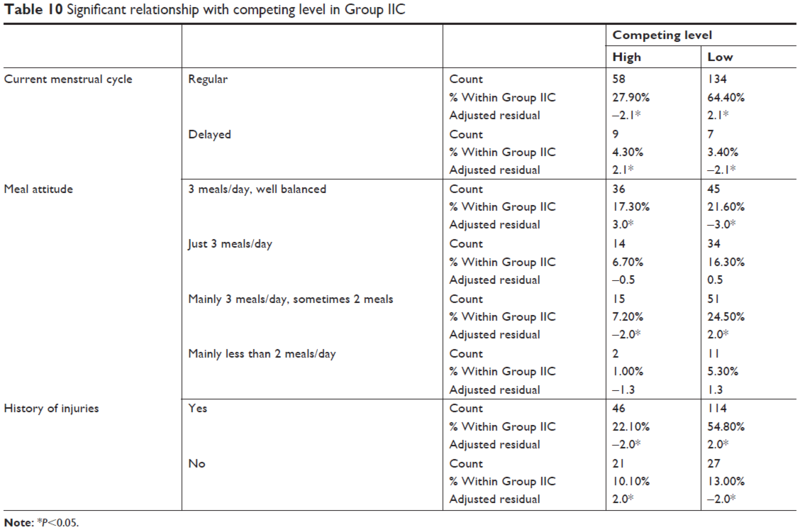 From the intensity-based classifications, Group IIC was the only group to show a significant relationship between competing level and meal attitude (Table 9). Athletes in the high competing level in this group had a significantly higher number of athletes who usually have well-balanced meals, while the number of athletes in low-level competition significantly chose less well-balanced meals (P=0.017). In high competitive level Group IB and IIIA sports, Group IIIA was significantly lower in starting age compared with other groups including the control group. Within Group IIIA, we found that the starting age in artistic gymnastics was significantly lower than that in volleyball (IB), badminton, tennis and soccer (IC), jumping (IIB), basketball (IIC), swimming and rescue swimming (IIC), throwing (IIIA), and controls. Additionally, Groups IIB and IIIA showed a significantly higher height at the higher competing level than at the lower level. In this study, we surveyed 531 Japanese collegiate athletes against 20 non-active control students to investigate the risk of FAT with regard to sports intensity level, sports type, and competing level. We aimed to identify which of the accepted FAT risk factors were correlated to the intensity and training volume of various sports in a Japanese collegiate female population. Additionally, as there are no current reports of the effect of competitive level on FAT risk at the college level in Japan, our secondary aim was to see how this variable impacted FAT risk factors in our respondents. Taken together, these results indicate a significant relationship between intensity and delay of menarche; training volume is less a factor than the actual intensity of the sport type itself. Interestingly, starting age is negatively correlated to menstrual irregularities, meaning that intensity of the sport type is more important. With regard to injuries, both the intensity of training and the amount of training time may affect susceptibility, even without menstrual irregularities. Musculoskeletal injuries may be either traumatic (broken bones, torn muscles) or chronic injuries brought about by repetitive motion and insufficient recovery time. We found that sports which are relatively restricted in dynamic movement (running, jumping, etc.) had a significantly higher reporting of severe musculoskeletal injuries. We also found that the overwhelming type of injury for athletes who have experienced severe musculoskeletal injury requiring more than 3 days of rest is the stress fracture (Fisher’s exact test, P<0.01). This is troubling, as this type of injury is highly indicative of repetitive motion injury. In almost all sports, with the exception of the heptathlon, the range of motion is restricted by the demand of the sport itself and it is possible that the cross-training schemes of heptathletes is somehow protective against stress fractures. These data indicate that, in sports with lower dynamic movement demands, cross-training methods (eg, plyometrics) involving complimentary musculoskeletal groups may serve a protective role against repetitive motion injuries. The trend of potential malnutrition in Group IIIA athletes is troubling, as skeletal, neurological, endocrine, reproductive, and muscular development could impact Group IIIA athletes at a much greater frequency than the general population. Based on our data, we would recommend that coaching staff retrain and focus Group IIIA athletes on the fundamentals of nutrition in an accountable manner. After finding that our intensity/training volume effects on FAT factor risk were in line with reports from other countries, we next sought to establish previously unreported links between competitive levels and menarche age/amenorrhea, musculoskeletal injury, and nutrition choices. A study in Japan reported that the rate of amenorrhea was 6% in female top competing level athletes and was higher than in nonathletes.6 Other studies in Japanese female top competing level athletes reported that 59.3% athletes had regular menstrual cycles while 32.9% of athletes had menstrual dysfunction (including 7.8% athletes with secondary amenorrhea).54 In our study, athletes with irregular menstrual status were up to nearly 30% and athletes with secondary amenorrhea were 5.6%, which was quite similar to the previous reports. As our own data were similarly reflective of this phenomenon, we then made comparisons based solely on competitive level. To avoid bias that would come from simply evaluating groups, we also used comparisons within each sport (LTH), each sport to its own group (STG), and each group to other groups (GTG). In this way, we hoped to establish a baseline of identification for sport types and groups in which competitive influence on FAT exists. With regard to menarche and competitive level, we found an overall trend of higher competitive level resulting in higher menarche ages though this effect disappeared in the group comparisons. We believe this is due to sport intensity and the aforementioned hormonal imbalances associated with intense/high-volume training being the key factors in delayed menarche.55 Competitive level, in the face of intense training and possible nutritive deficiencies, may simply be a complicating secondary factor. However, with respect to competitive levels and amenorrhea, we found that the lower levels within groups had more menstrual irregularities as opposed to their highly competitive counterparts (with the exception of IC, where high competition correlated to more menstrual irregularities). We theorize that this unusual finding may be due to a “veteran effect,” where higher levels of competition effectively filter out athletes whose bodies experience amenorrhea; these unadaptable athletes would be then forced to compete either at low levels or quit entirely. In Group IC, which includes endurance sports such as running and race walking, the effect of constant body fat mobilization may induce hormonal cascades that adversely affect menstruation at the higher competitive levels. Next, we looked at the effect of competitive levels on musculoskeletal injuries and found no general correlation between them. However, we did see that, in Group IIC, the lower competitive levels had higher injury numbers (but not stress fractures) and, in Group IIB, the preponderance of injuries suffered was stress fractures. As field events like jumping and sprinting cause microfractures that may worsen due to the repetitive nature of those sports, it has been reported that these athletes are at a higher risk of stress fractures.56 Group IIC sports included team sports such as basketball and lacrosse as well as swimming and rescue swimming. At the lower level in these sports, higher injuries might be due to the relative inexperience of the athletes but the fact that the stress fracture is less common than other types of injuries could be explained by either the lack of impact (eg, swimming) or the constant, low-level motion required to follow the ball (basketball, lacrosse) or stay with the pack (mid-distance running). Several limitations of this must be acknowledged. First, no actual diagnoses of FAT risk factors were clinically conducted; relationships to risk factors were calculated based solely on survey responses. Second, surveys were not collected at the immediate end of each season and medical records for each of the athletes were not consulted to verify answers. Overreliance on the recollections and self-reports of athletes may have introduced errors into our data. We also did not measure menstrual cycles or monitor estrogen levels within athletes during the study, relying solely on questionnaires, which may not capture a complete picture of injury risk during the various phases of the cycle. Finally, comparisons that isolate relationships between variables may conceal multivariable relationships. However, to the best of our knowledge, this is the first report of its kind with a large sample size that examines the parameters of Japanese female collegiate athletes with respect to FAT and will serve as a foundational report upon which to build future prospective studies featuring clinical validation of FAT risk factors. We found that Japanese collegiate athletes experience the FAT risk factors (delayed menarche/amenorrhea, musculoskeletal injury, and poor nutrition) in a manner correlated with the intensity of their sport types and, to a lesser extent, the volume of training endured. Of particular note is the trend of repetitive motion injury in endurance/non-dynamic sports. Additionally, we also found some correlation between lower competitive levels and delayed menarche/amenorrhea. However, in general, competitive level had no effect on musculoskeletal injury or nutrition choice. Taken together, our results highlight the need for coaching staff and universities to adjust sport rules and expectations to compensate for the higher risks of FAT in athletes subjected to high intensity, high training volume, and highly competitive sports. This project was funded by The University of Tsukuba (Funding #10100). The sponsors of this study had no role in the study design, collection/analysis of data, the writing of the manuscript, or the decision to publish. All authors contributed towards data analysis, drafting and revising the paper and agree to be accountable for all aspects of the work. Wiese-Bjornstal DM. Psychology and socioculture affect injury risk, response, and recovery in high-intensity athletes: a consensus statement. Scand J Med Sci Sports. 2010;20 Suppl 2:103–111. Laursen PB. Training for intense exercise performance: high-intensity or high-volume training? Scand J Med Sci Sports. 2010;20 Suppl 2:1–10. Foster C, Daines E, Hector L, Snyder AC, Welsh R. Athletic performance in relation to training load. Wis Med J. 1996;95(6):370–374. Sawai A, Tochigi Y, Kavaliova N, et al. MRI reveals menstrually-related muscle edema that negatively affects athletic agility in young women. PLoS One. 2018;13(1):e0191022. Nattiv A, Loucks AB, Manore MM, et al. American College of Sports Medicine position stand. The female athlete triad. Med Sci Sports Exerc. 2007;39(10):1867–1882. Japan Sport Council. Scientific reports from Japan Institute of Sports Sciences, Japan; 2013. Available from: https://www.jpnsport.go.jp/jiss/Portals/0/images/contents/woman/joseishien_2016.pdf. Accessed October 18, 2018. Kikuchi m, Nakamura I, Kashimura O. The Athletic Factors and Status of Irregular Cycle and Amenorrhea in the Female College Middle and Long-Distance Runners. Jpn J School Health. 2008;50:49–55. Komaki K, Takenaka K. Eating attitudes in Female Collegiate Athletes. Bulletin of the Institute of Physical Education [Keio University]. 2001;40(1):39–45. Okano G, Holmes RA, Mu Z, Yang P, Lin Z, Nakai Y. Disordered eating in Japanese and Chinese female runners, rhythmic gymnasts and gymnasts. Int J Sports Med. 2005;26(6):486–491. Barrow GW, Saha S. Menstrual irregularity and stress fractures in collegiate female distance runners. Am J Sports Med. 1988;16(3):209–216. Brunet M. Female athlete triad. Clin Sports Med. 2005;24(3):623–636. Lebrun CM, Rumball JS. Female Athlete Triad. Sports Med Arthrosc. 2002;10(1):23–32. Otis CL, Drinkwater B, Johnson M, Loucks A, Wilmore J. American College of Sports Medicine position stand. The Female Athlete Triad. Med Sci Sports Exerc.1997;29(5):i–ix. Nichols JF, Rauh MJ, Lawson MJ, Ji M, Barkai HS. Prevalence of the female athlete triad syndrome among high school athletes. Arch Pediatr Adolesc Med. 2006;160(2):137–142. Mitchell JH, Haskell W, Snell P, van Camp SP. Task Force 8: classification of sports. J Am Coll Cardiol. 2005;45(8):1364–1367. SooHoo S, Sell K, Reel JJ. Cheerleading. Berkshire Encyclopedia of World Sport. 1st ed. Great Barrington, MA: Berkshire Publishing Group; 2005:301–306. Koutedakis Y, Hukam H, Metsios G, et al. The effects of three months of aerobic and strength training on selected performance- and fitness-related parameters in modern dance students. J Strength Cond Res. 2007;21(3):808–812. Goodwin EP, Adams KJ, Shelburne J, Debeliso M. A Strength and Conditioning Model for a Female Collegiate Cheerleader. Strength Cond J. 2004;26(6):16–21. Padfield JA, Eisenman PA, Luetkemeier MJ, Fitt SS. Physiological profiles of performing and recreational early adolescent female dancers. Pediatr Exerc Sci. 1993;5(1):51–59. Thomas DQ, Seegmiller JG, Cook TL, Young BA. Physiologic profile of the fitness status of collegiate cheerleaders. J Strength Cond Res. 2004;18(2):252–254. Thompson SH, Digsby S. A preliminary survey of dieting, body dissatisfaction, and eating problems among high school cheerleaders. J Sch Health. 2004;74(3):85–90. 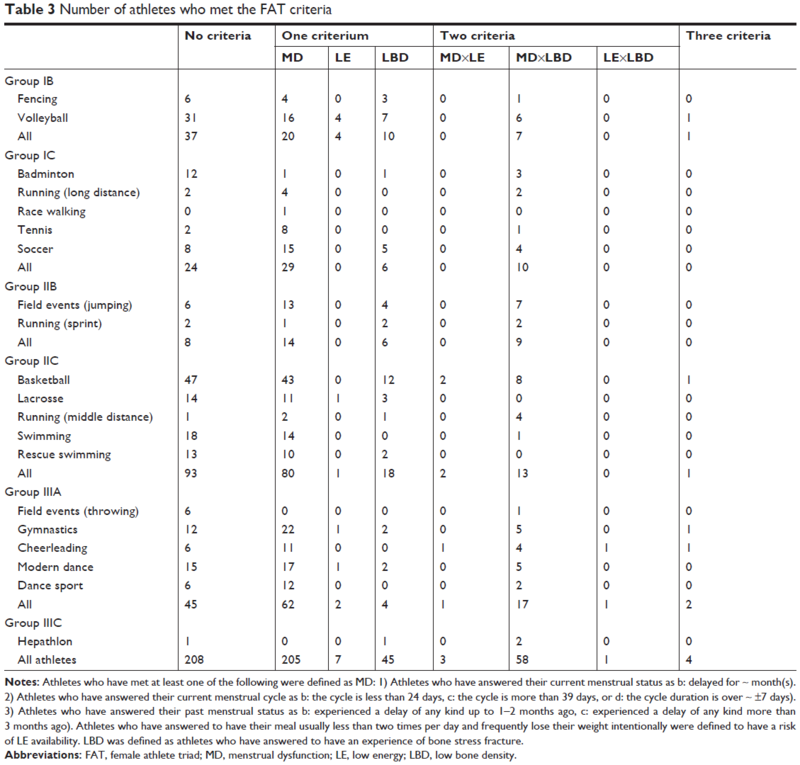 Alfaro V, Palacios L, Torras R. Blood lactate levels during a combined water-based exercise test in elite lifesaving athletes. J Exerc Physiol Online. 2002;5(1):1–4. Torstveit MK, Sundgot-Borgen J. Participation in leanness sports but not training volume is associated with menstrual dysfunction: a national survey of 1276 elite athletes and controls. Br J Sports Med. 2005;39(3):141–147. Malina RM, Spirduso WW, Tate C, Baylor AM. Age at menarche and selected menstrual characteristics in athletes at different competitive levels and in different sports. Med Sci Sports. 1978;10(3):218–222. Baxter-Jones AD, Helms P, Baines-Preece J, Preece M. Menarche in intensively trained gymnasts, swimmers and tennis players. Ann Hum Biol. 1994;21(5):407–415. Dušek T. Influence of high intensity training on menstrual cycle disorders in athletes. Croat Med J. 2001;42(1):79–82. Dusek T. High intensity training and menstrual cycle disorders in athletes. Int Sports Med J. 2004;5(1):37–44. Redman LM, Loucks AB. Menstrual disorders in athletes. Sports Med. 2005;35(9):747–755. Nose S, Dohi M, Namba A. Investigation of amenorrhea and stress fractures in elite female athletes. Jpn J Soc Clin Sports Med. 2014;22(1):67–74. Malina RM. Menarche in athletes: a synthesis and hypothesis. Ann Hum Biol. 1983;10(1):1–24. Myer GD, Jayanthi N, Difiori JP. Sport specialization. part I: does early sports specialization increase negative outcomes and reduce the opportunity for success in young athletes?. Sports Health. 2015;7(5):437–442. Sundgot-Borgen J, Torstveit MK. Aspects of disordered eating continuum in elite high-intensity sports. Scand J Med Sci Sports. 2010;20 Suppl 2:112–121. Olds TS, Norton KI, Craig NP. Mathematical model of cycling performance. J Appl Physiol. 1993;75(2):730–737. Stefani L, Galanti G, Lorini S, Beni G, Dei M, Maffulli N. Female athletes and menstrual disorders: a pilot study. Muscles Ligaments Tendons J. 2016;6(2):183–187. Nagasawa N, Iwata K, Tsuge M, Sato F, Kawano Y. The Dietary Assessments for Collegiate Female Athletes. Jpn J Nutr Diet. 2004;62(6):361–368. Kawano Y, Uehara G, Suda H, Sato F. Life Style and Dietary Habits in Female Athletic College Students. Jpn J Nutr Diet. 1997;55(6):327–335. Okano G, Taguchi M, Mu Z, Sato Y, Kaji M, Sugiura K. A survey comparing nutritional status and exercise training programs between adolescent Japanese and Chinese athletes. Jpn J Phys Fit Sports Med. 1993;42(5):446–454. Seiki K. On nutritional survey of the Japanese candidates for Olympic Games. J Health Phys Educ Rec. 1992;42:612–618. Yamanaka RIE, Katayose M, Yukawa K, Tahara Y, Tsunawake N, Mori S. Dietary conditions on elite athletes in Nagasaki prefecture. Jpn J Phys Fit Sports Med.1994;43(1):92–103. Okano G, Sato Y, Tarnoff H, et al. Prevalence of disordered eating patterns and menstrual status in Japanese female athletes. Jpn J Phys Fit Sports Med. 1996;45(4):419–427. Wiita BG, Stombaugh IA. Nutrition knowledge, eating practices, and health of adolescent female runners: a 3-year longitudinal study. Int J Sport Nutr. 1996;6(4):414–425. Kawai M. An Example of Nutrition Support in Elite Female Runners and College Students. Nippon EiyoShokuryoGakkaishi. 2002;55(6):361–365. Iwami M, Hirashima M. Instruction on the Dietary habits of university Athletes. Memoris of the Gifu City Women’s College. 2005;55:77–80. Mcneal JR, Sands WA, Shultz BB. Muscle activation characteristics of tumbling take-offs. Sports Biomech. 2007;6(3):375–390. Penitente G, Sands WA. Exploratory investigation of impact loads during the forward handspring vault. J Hum Kinet. 2015;46(1):59–68. Baldari C, Guidetti L. VO2max, ventilatory and anaerobic thresholds in rhythmic gymnasts and young female dancers. J Sports Med Phys Fitness. 2001;41(2):177–182. Sasaki K, Neptune RR. Muscle mechanical work and elastic energy utilization during walking and running near the preferred gait transition speed. Gait Posture. 2006;23(3):383–390. Burke LM, Slater G, Broad EM, Haukka J, Modulon S, Hopkins WG. Eating patterns and meal frequency of elite Australian athletes. Int J Sport Nutr Exerc Metab. 2003;13(4):521–538. Farajian P, Kavouras SA, Yannakoulia M, Sidossis LS. Dietary intake and nutritional practices of elite Greek aquatic athletes. Int J Sport Nutr Exerc Metab. 2004;14(5):574–585. Smolak L, Murnen SK, Ruble AE. Female athletes and eating problems: a meta-analysis. Int J Eat Disord. 2000;27(4):371–380. Greenleaf C, Petrie TA, Carter J, Reel JJ. Female collegiate athletes: prevalence of eating disorders and disordered eating behaviors. J Am Coll Health. 2009;57(5):489–496. Wildes JE, Emery RE, Simons AD. The roles of ethnicity and culture in the development of eating disturbance and body dissatisfaction: a meta-analytic review. Clin Psychol Rev. 2001;21(4):521–551. Nose S, Dohi M, Namba S. Rate of low-dose estrogen progestin (LEP) use in elite Japanese female athletes and issues concerning LEP use. Jpn J Phys Fit Sports Med. 2014;22(1):122–127. Merzenich H, Boeing H, Wahrendorf J. Dietary fat and sports activity as determinants for age at menarche. Am J Epidemiol. 1993;138(4):217–224. Mayer SW, Joyner PW, Almekinders LC, Parekh SG. Stress fractures of the foot and ankle in athletes. Sports Health. 2014;6(6):481–491. Williams C, Rollo I. Carbohydrate Nutrition and Team Sport Performance. Sports Med. 2015;45 Suppl 1(1):13–22. di Cagno A, Battaglia C, Fiorilli G, et al. Motor Learning as Young Gymnast’s Talent Indicator. J Sports Sci Med. 2014;13(4):767–773. Georgopoulos NA, Markou KB, Theodoropoulou A, et al. Height velocity and skeletal maturation in elite female rhythmic gymnasts. J Clin Endocrinol Metab. 2001;86(11):5159–5164. Reilly T, Secher N, Snell P, Williams C. Physiology of Sports. 1st ed. London: E & FN spon and Taylor & Francis publisher;1990.